Mr. and Mrs. Santa Claus have a close connection with friends in Huron County. In fact, this Christmas season will mark the 24th time Santa has made the trip from the North Pole to Huron County in December to visit his friends and be the star of the Breakfast with Santa at Knox Presbyterian church in Goderich. For the past five years Mrs. Claus has taken time out from baking her special Christmas shortbread and gingerbread cookies and forming the colourful candy canes and joined Santa for the trip south. It is a huge commitment. After all, December is the busiest time of the year for both Mr. and Mrs. Claus. They leave the elves with their regular work of making the toys and feeding the reindeer plus they take on the added work of answering all the children’s letters that arrive over the weekend when the Clauses are helping the Women’s Shelter. I managed to have a Skype interview with Santa at his home at the North Pole. I asked if it was difficult to remember the names of all the children who sit on his knee year after year at the breakfast and photo shoot and he replied he gets help from a local lady named Barb Hollingsworth. He also added that there are a large number of volunteers, who help with the breakfast and decorating in the church, who are dedicated to raising funds for the Women’s Shelter in Goderich and he was afraid he didn’t know all their names. He continued by saying that last December there were 280 children who came for breakfast. Not all of them were keen to sit on his knee and tell him what they were wishing for, but the ones who did sit on his knee have their names recorded in his big book along with their Christmas wishes, and he was pretty sure there were at least 200 names added last year. He said when he thinks back over the 24 years to the beginning, it was these children’s parents that were the young ones sitting on his knee and telling him their wishes. He called that experience really awesome. I inquired of him what children have been consistently asking for over the years and he replied Lego and Barbie dolls. He said he is often taken off guard when a child says they want a baby sister or anything purple or simply “just surprise me” He remembers fondly about a little boy who asked for a puppy, a snake, a tarantula, a gecko and a rabbit too. When I asked him how this unique connection with children from Huron County came about, Santa told me his close Huron County friends had a dear friend named Sue Munnock, who was a board member at the Women’s Shelter. When she became very, very ill, he asked her if there was any wish he might be able to help make come true. Sue’s wish was for him to ask his boyhood friend Santa if he could make the effort to visit Goderich every year and help raise much needed funds for the Women’s Shelter by participating in a Breakfast with Santa program. 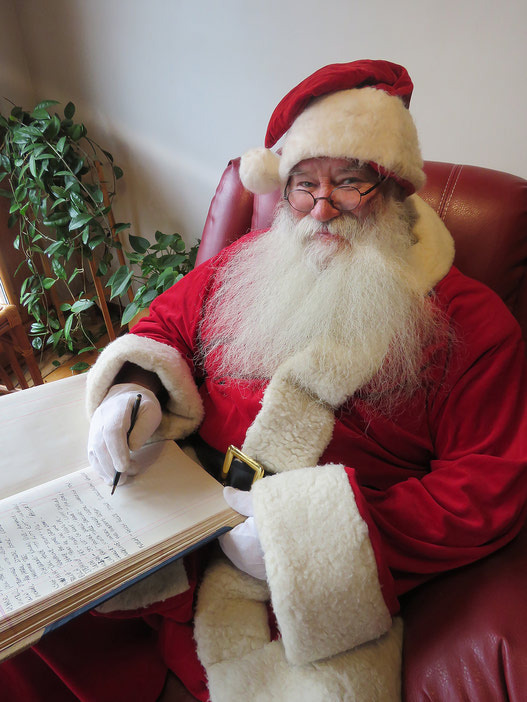 That is when Santa’s special Huron County friend said he would try his best. Well, lo and behold, the Huron County man reached Santa on his cell phone and asked if by any chance Santa could make Sue’s wish come true. Santa said, “I sure can!” Well, that was super news and the next part of the plan had to be put into motion. So Mary Grieg-Wallace and a dedicated team of volunteers oversaw the development of Breakfast with Santa at Knox Presbyterian church .